Lock in a great price for Calypso Suites Hotel – rated 8.6 by recent guests! Spacious and clean comfortable rooms. Great breakfast. Amazing breakfast which even included shrimp, many different types of tropical fresh juices, and lots of stir fry dishes! Location is awesome. Staff are very helpful especially Leo. Great breakfast. Rooms were super clean and the beds are the comfortable i’ve stayed in. Staff are extremely welcoming and friendly, going out of their way to provide information about trips and recommendations in the area. Couldn’t recommend this place enough. This was our first time in Hanoi, we couldn't have chosen a better place. Room was very clean, including bathroom, breakfast was delicious, the food is made at the moment. The staff are amazing, very polite, very helpful and always willing to help us. They let us leave the baggage for 3 days. I would definitely recommend this place in Hanoi. Staff were extremely friendly and helpful . The location is perfect only a 3 minute walk to lake.Breakfast was good for Vietnam.Bed was reasonably comfortable.Great value for money. We really like this hotel. Everything was awesome. Staffs were helpful and friendly. Located in the heart of the city so we could walk everywhere. Highly recommended!!! Calypso Suites Hotel This rating is a reflection of how the property compares to the industry standard when it comes to price, facilities and services available. It's based on a self-evaluation by the property. Use this rating to help choose your stay! Calypso Suites Hotel features traditional French-style rooms with free Wi-Fi in Hanoi’s Old Quarter district. A 3-minute walk from Hoan Kiem Lake, it has a restaurant and 24-hour front desk. 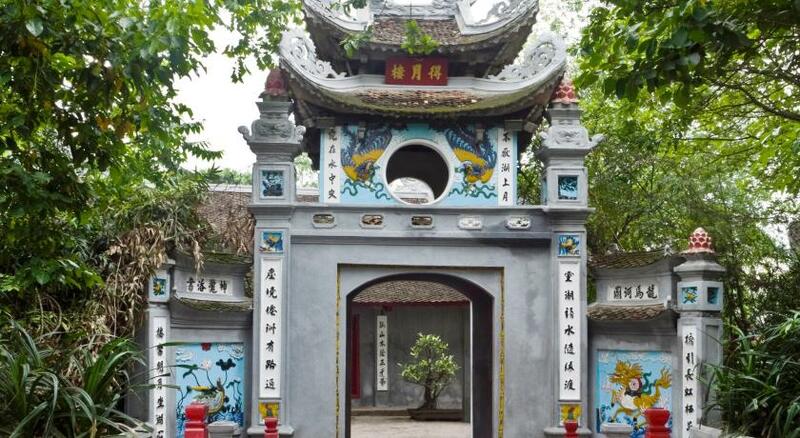 Nearby attractions including Ngoc son Pagoda and Turtle Tower are also a 3-minute walk away. It takes 10-minutes by foot to reach Dong Xuan Market and Hanoi Opera House. Noi Bai International Airport is approximately a 45-minute drive away. Featuring red and white themes, each room is elegantly decorated and features a flat-screen cable TV, safe and desk. Tea/coffee maker and bottled water are included. Calypso Suites Hotel provides a currency exchange, tour desk and ticket service for guests. Bicycle and car rental services are also available. A buffet breakfast is served every morning at the hotel’s restaurant. When would you like to stay at Calypso Suites Hotel? Traditional French-style room has a flat-screen cable TV, safe, desk, tea/coffee maker and bottled water. Public parking is available at a location nearby (reservation is not needed) and costs VND 116523.28 per day. Larger, traditional French-style room features a flat-screen cable TV, safe, desk, tea/coffee maker and bottled water. Large, traditional French-style suite features a flat-screen cable TV, safe, desk, tea/coffee maker and bottled water. Spacious, traditional French-style suite features a flat-screen cable TV, safe, desk, tea/coffee maker and bottled water. Private bathroom includes a separate bathtub and shower. House Rules Calypso Suites Hotel takes special requests – add in the next step! Calypso Suites Hotel accepts these cards and reserves the right to temporarily hold an amount prior to arrival. The room had a wall right outside the window, no ventilation at all so extremely humid, so much so that I woke up feeling dizzy, sick and had to get out urgently. Took a few hours to feel better. I think some other rooms have a proper window. Reception staff were very pleasant and helpful. I had hair in my phó noodle soup for 2 days. Nevertherless the soup tasted good. The bath/shower was a little difficult to get out of. For older people it might not have been so easy. There was a large window in the room but it was viewing to another building half a meter away from the hotel. Drain was clogged in both the bathroom sink and shower. They upgraded us when we checked in.